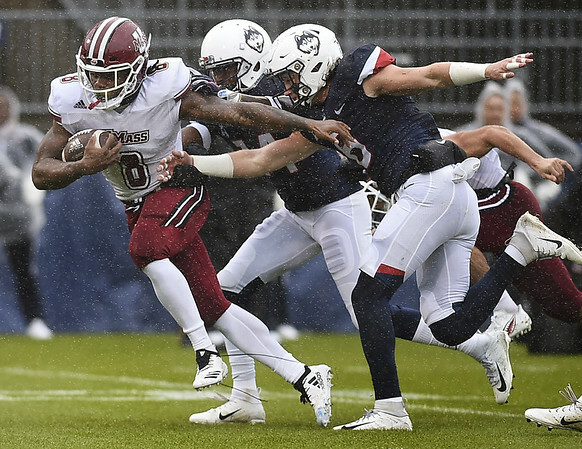 STORRS - Marquis Young rushed for 148 yards including a fourth-quarter touchdown that gave UMass a 22-17 win over UConn on Saturday. Young got an assist from teammates who helped shove him into the end zone from 3 yards out to take the lead with 3:39 remaining. On UConn's next play from scrimmage, Lee Moses intercepted David Pindell's pass near midfield and the Minutemen (3-5) were able to run out the clock to snap a three-game losing streak. Young, who carried the ball 26 times, turned in his 12th career 100-yard rushing game. Ross Comis, starting in place of injured Andrew Ford, threw for 197 yards and two touchdowns with one interception. Michael's Tarbutt's 41-yard field goal extended the Huskies’ lead to 17-9 early in the fourth quarter. Comis answered on the first play after the ensuing kickoff, throwing to Zak Simon for a 67-yard touchdown. Young's game-winning score capped an 11-play, 81-yard drive. Pindell threw for only 15 yards on six attempts while rushing for 120 yards, including a 25-yard score as he went over 2,000 yards total offense this season for the Huskies (1-7), who lost their fifth straight. Posted in Newington Town Crier, UConn on Saturday, 27 October 2018 17:15. Updated: Saturday, 27 October 2018 17:20.